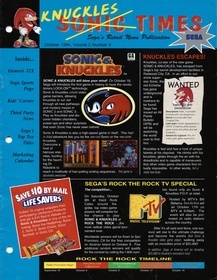 Sonic Times is a promotional newsletter sent to Sega retailers during the height of the Sega Genesis' popularity in the United States produced by Sega of America's merchandising department. The content of the eight-page mini-magazine is geared specifically towards retail stores, detailing marketing schedules, top games being sold, upcoming first- and third-party games, and work done with Sega of America's non-profit wing, the Sega Foundation. #0209: "Volume 2 Number 9: October 1994"
#0302: "Volume 3 Number 2: April/May 1995"